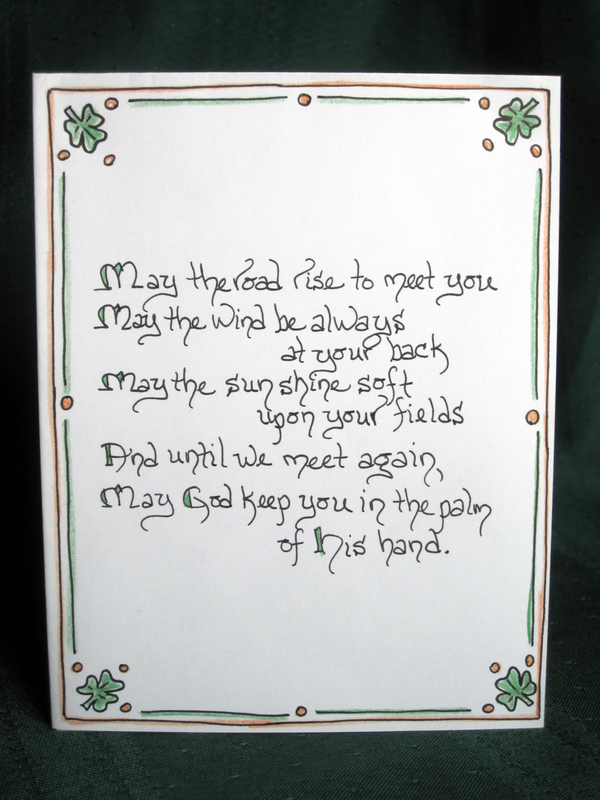 As I may have mentioned before, there’s a lot of Irish in the Dearliest’s ancestry. 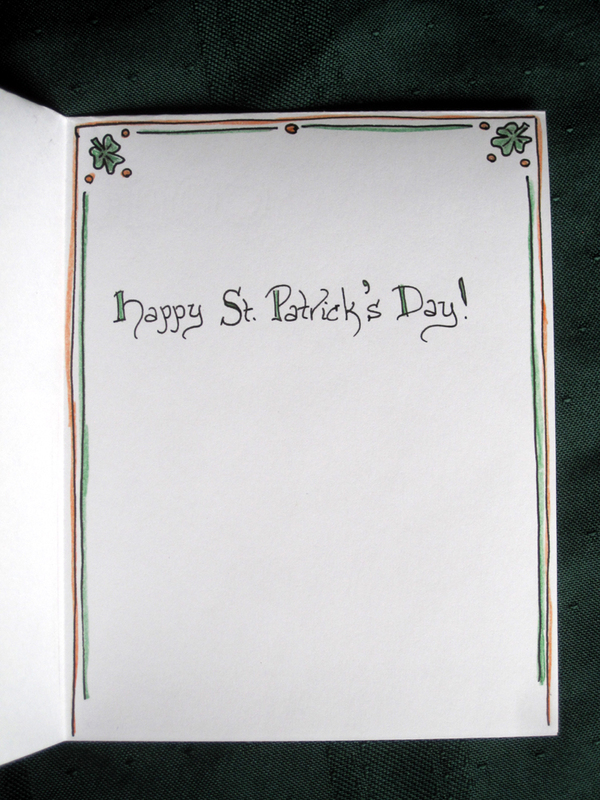 St. Patrick’s Day occasionally got a nod in my family growing up, but it wasn’t a big deal. Then I married into the Dearliest’s family and all at once I learned about corned beef, boiled cabbage, and drinking songs. In honor of the upcoming holiday, I decided to try my hand at a new thing! Well, not really a new thing. I’ve been making cards for years (one of many skills my mother taught me), and starting a couple months ago I started feeling like I ought to put a few together for the shop. Procrastinating being what it is for me, I didn’t do anything about it until last night. But I finally did something! Sadly we’ve been having fog, snow, and rain the last few days so lighting was not so good for pictures. I didn’t much care for the first attempt (the top one, although maybe I’d like it better in a solid color), but I rather like the second design, and I have some other ideas (mostly on how to work in different colors). This project taught me that I’m actually not so much a fan of color work. All the moving back and forth between yarns really slows the fingers down. It gives me a whole new appreciation for all of the crocheters and knitters I know who regularly use multiple colors at once! I’m still trying to come up with a baby-safe way to “catch” the fish. With the older kiddos I can hand them a clothespin on a string tied to a stick, but with Arc on the floor a clothespin isn’t so good. I thought about velcro, but it would be such a small bit of it…not sure how to stitch it onto cotton yarn and have it stay. LK didn’t eat his lunch today, because eggs are icky or something (let’s forget for a moment that this little guy regularly packs away 2 fried eggs at breakfast). When he does this he’s not allowed to complain about being hungry, and quite frequently whatever he didn’t eat shows up at the next meal or snack because, yanno, parenting and stuff. Here we are, a scant few minutes away from snack time and LK casually asked if the food from lunch is still in the pan. He halfheartedly peered into the kitchen while I looked at him sideways. I wish I could capture in words the rainbow of joy-joy that appeared over (and through) him when I told him yes, the lunch food was all gone. He was getting something else for a snack. The rascal. I have half a mind to hand him a can of tuna. In other news, apparently Pokado can read? I had no clue, but she recognized “fish” and pointed it out to the Dearliest and LK. 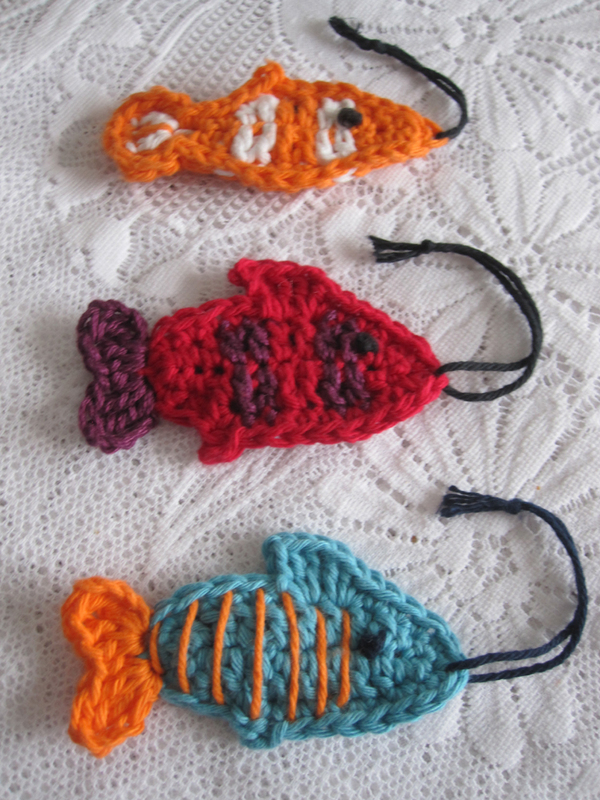 The latest obsession in the house is fishing. The Dearliest got a fishing license, and recently he started collecting his fishing gear. LK now talks about rods, reels, and lines; steelhead, salmon, and catfish (which are “really really creepy”), and the kids all play “Fishing” now with string and plastic cups and a wild imagination. I asked Pokado once what she was doing with a spoon and she returned with, “Cleaning the fish!” Oookay. It does have me thinking, though. 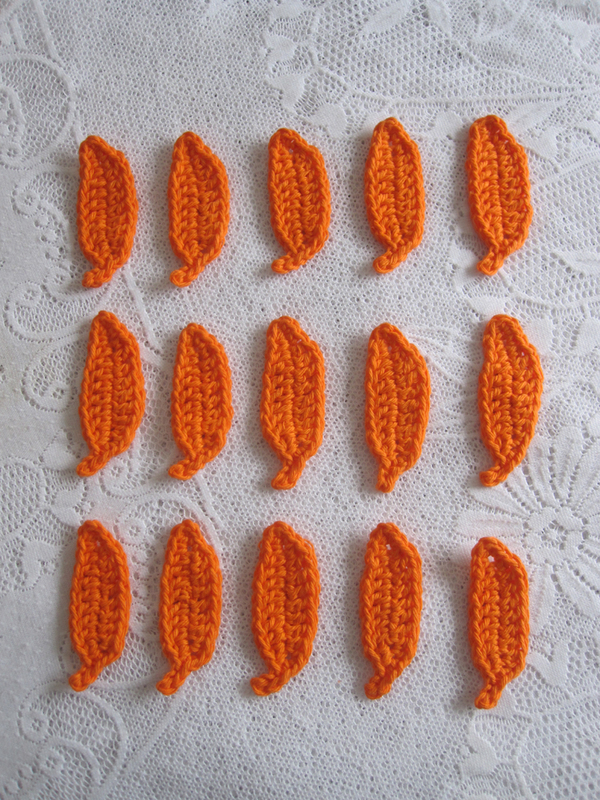 The leaf pattern would be really easy to adjust a little bit to turn into a fish pattern! I think I’ll try making up a few and see what happens. I’ve been slowly working my way through deep cleaning my house. After 3 weeks in the kitchen I couldn’t take the space anymore, so I started working on other rooms (still have kitchen back splashes, baseboards, and the oven to clean, but I’m doing a little bit of that every couple days or so). I’ve done the dining room and made good headway in the master bedroom. On the first day of the master bedroom I found my forgotten (and full) “to-repair” basket, within which lay (among other things) a vest of the Dearliest’s that needed a new zipper. I will not embarrass myself completely by sharing how long the vest sat in the repair basket, and moreso how long I forgot I even HAD a repair basket. I’m a royal beginner to sewing, all things considered, so my first step was to ask the Dearliest if he knew how to replace zippers in existing garments (he taught me a lot of sewing basics, so I figured there was a chance!). But no, he did not, so I took to the internet for learning. Once I felt like I had a handle on the concept I sat down with my seam ripper and started ripping away. 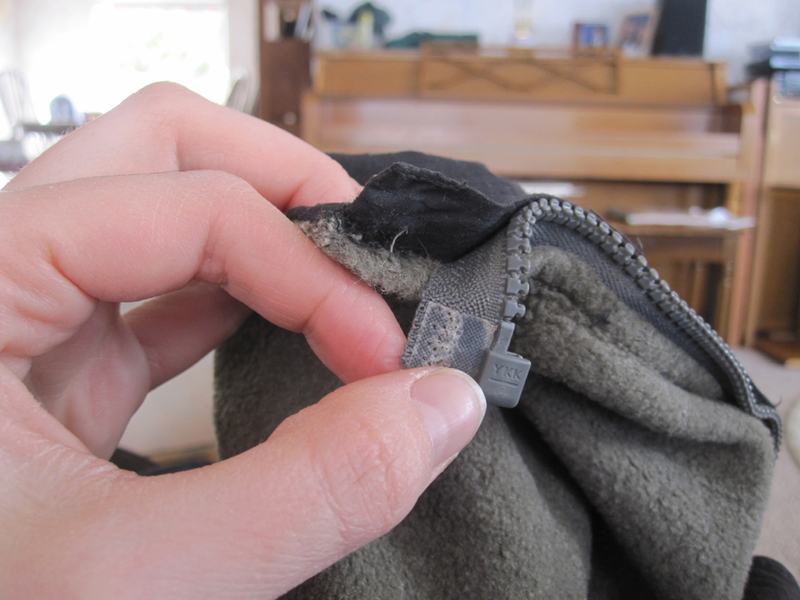 It took me about 10 minutes to discover that the zipper on the vest had THREE rows of stitching (two of which were hidden/ invisible seams), which instantly made it harder for me. At which point I turned to the Dearliest and asked if the vest was worth it to him for me to invest the time and energy into the project. I was (am!) happy to do it, but if it wasn’t something he was going to really wear or use I had plans to rethink the project. Once I got the bottom inch started, it actually went a little faster. In another 20 minutes I ripped out most of 2 of the seams on that side, so I’m hopeful that if I dedicate 10-15 minutes a day to the vest I’ll have the old zipper out in another week or so. Then I need to track down my zipper foot for my sewing machine and I get to learn all about switching feet! Because I’ve never done that before. 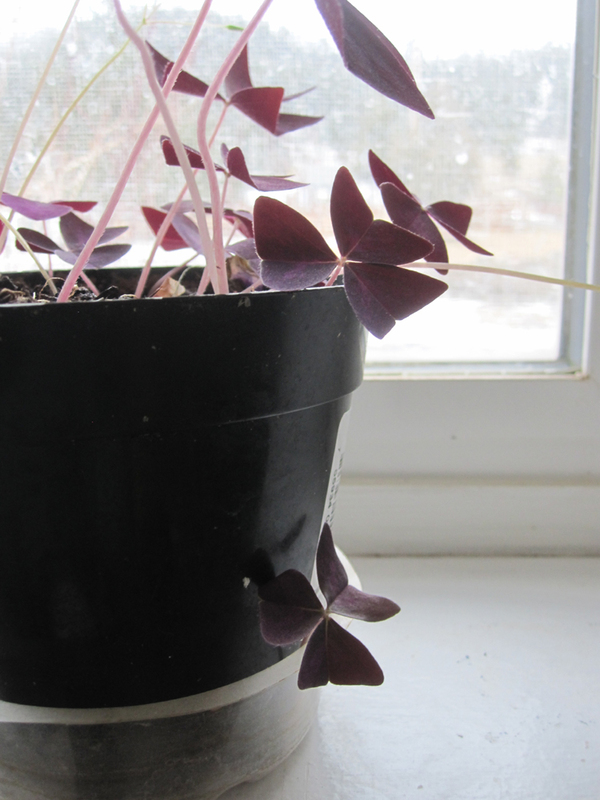 As I was cleaning dishes the other day I noticed something was different with my purple shamrock. Not sure if it’s decided to go exploring or is trying tell me it needs a bigger pot. Has anyone else tried this yarn? One of my dear sister-in-laws gave it to me for my birthday, and I’ve never seen anything like it! 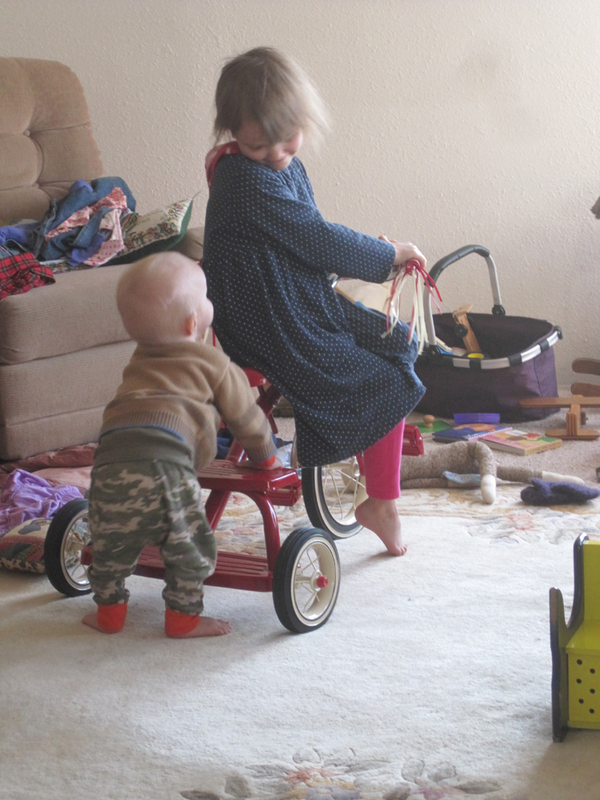 Fun and quirky (and, let us not forget, purple!). I had to do a little reading on how to work with it, though. It’s not like your garden variety yarn. I’m guessing it hasn’t been on the market super long, because I didn’t find a whole lot of projects on Ravelry. 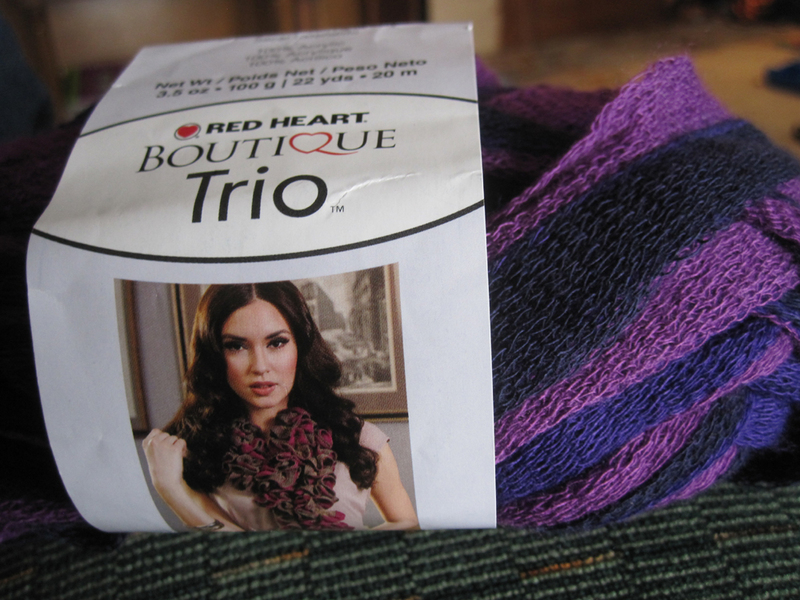 In fact, the only thing I could find was the scarf (and variations of the scarf) that comes on the yarn label. Speaking of the label, it has a needle guide but no hook guide. I consider this a challenge for the future, but it may be futile. I’ve spent way more time than I’d like to admit thinking about how to crochet this yarn and I’ve got nothing. It would be possible if you combined it with regular yarn, but…well, I’m still thinking. 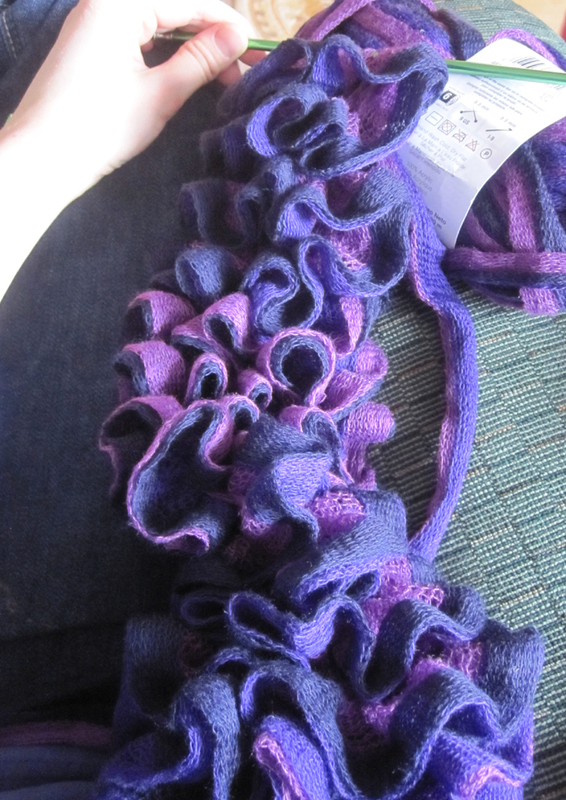 For now, I’ve been having fun with my becoming-scarf! You pick which color you want to knit into and work with the top couple rows of holes on that color. It leaves the other 2 colors free to ruffle and bounce. To change the color, you just twist the yarn at the end of a row and carry on. 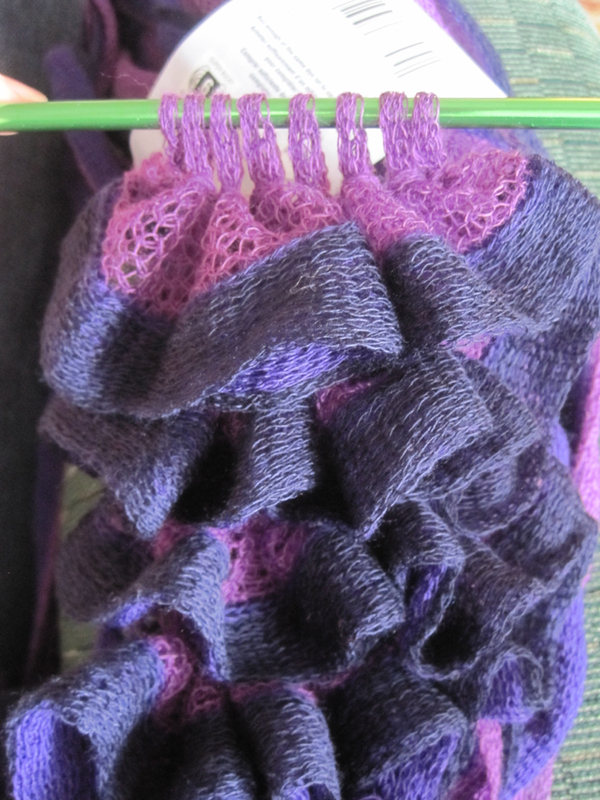 Here the bottom half or so has been fluffed and manipulated, so you can see how much more body the yarn takes on. 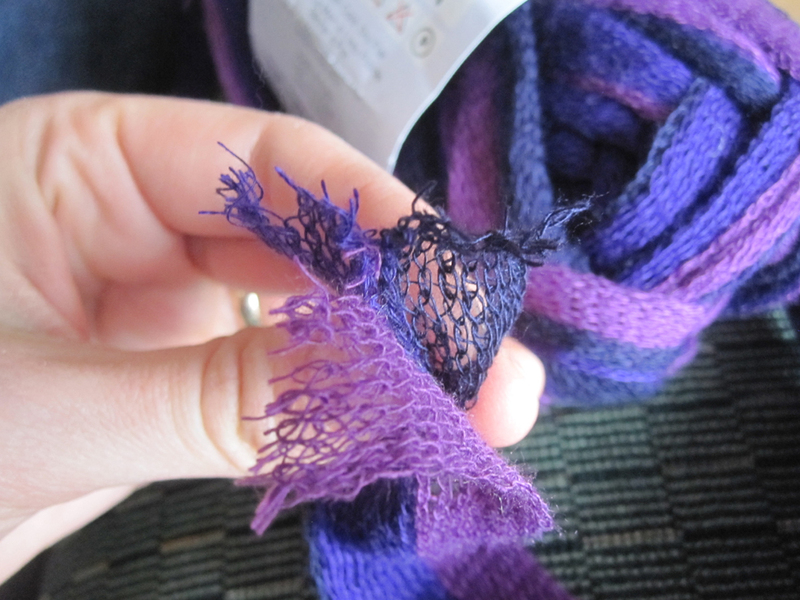 I could see this yarn being very frustrating for some people, but once I got the hang of it I found I rather enjoyed it! You may recall that shortly after Arc was born I was sick for a long time. I recently went back and figured out that start to finish, the whole thing lasted over 3 months. 3 months! Ever since I recovered I’ve felt like I wanted to share what I learned in the hopes that maybe, just maybe, it might spare someone else from going through what I went through. Disclaimer: I am not a doctor. I have no official medical training. When I get sick, or when someone close to me gets sick, I’m one of those people who reads everything I can find on the illness. Articles, books, web forums, medical journals…seriously, whatever I can find. This post and any that follow on the subject are simply my thoughts based on my experience. To begin, here’s a brief rundown on yeast infections: Yeast is a fungus, one that naturally occurs in the body. Sometimes an imbalance occurs and there is an overgrowth, causing an infection. A lot of the time there are obvious symptoms, like white spots if it’s in the mouth, abnormal discharge if it’s vaginal, brittle nails if it’s in the feet or hands, etc. A person doesn’t have to have obvious symptoms, however, and if left untreated a yeast infection can become systemic. A systemic yeast infection has matured such that it enters into the bloodstream, traveling to other areas of the body to wreak havoc. This is what happened to me. I had no idea a yeast infection could be responsible for so many illnesses until I sat down and specifically searched for a connection between yeast, extreme fatigue, eczema, digestive unrest, arthritis, and depression. Who would’ve thought they could all be related? Not me! Step one was discovering the fungal infection (this took about one month). Step two was getting rid of it (this took about two months). I kept anti-fungal medication in the back of my mind, but that was going to be my last course due to various reasons. I decided to do my own research and learned that there are a number of fungal strains that are highly resistant to medications anyway, so if I could find something better I wanted to. What I needed to do was get the yeast back in balance, which meant simultaneously killing off the bad stuff while bringing in the good stuff. I tried my usual home remedies of yogurt, cranberry juice, apple cider vinegar, and garlic, but after one week of fairly heavy doses they’d barely made a dent. I needed big guns. My mother-in-law suggested I look into kefir. About the same time one of my sister-in-laws suggested I look into coconut oil. At the time I knew very little about them, but I was desperate, did my reading, and started using them immediately (more on that later). This. This was the turning point. In three days time I went from so miserable I could barely get out of bed (most the time I stayed in my pajamas!) to being able to fix eggs and have energy left to do the dishes. Three days! Right, so, I backed way off, gave my body a few days to recover, then developed a less-aggressive attack plan. It took around 2 months, but the progress was steady and at the end of it I was well. Completely well. Up next time: Kefir, coconut oil, and the connection between yeast and iron. 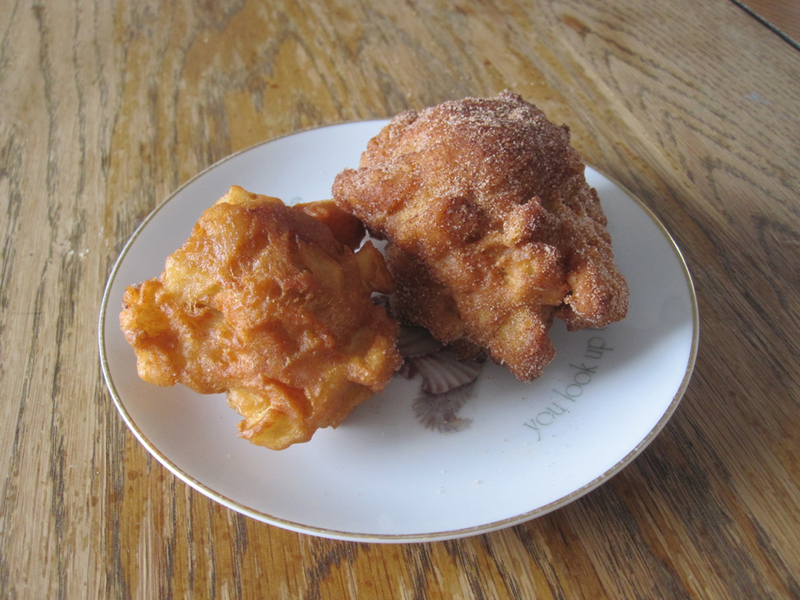 The Dearliest has a fondness for doughnuts, particularly apple fritters. I also have a fondness for doughnuts, particularly chocolate glazed raised (but alas I’m not writing about them right now). When I left California to marry the Dearliest, it was with a very high doughnut standard. I have yet to discover anything in this area of Idaho that comes even close, so this morning I decided to make my own! My word. They proved insanely easy, and I definitely think homemade doughnuts are my new standard. I used this recipe with the addition of 1 teaspoon of cinnamon to the batter. Now that I know how the batter works, next time I will probably make some of the other adjustments mentioned in the comments, namely incorporating some wheat flour, maybe try honey instead of sugar, doubling the batter (but not the apples), and adding a splash of vanilla. Chocolate glazed raised are up next. For sure.